CB Radio Systems, a Mexican Connection Essential… Why??? CB radios with external antennas are essential during Chapter 8 rallies. We all travel around the US without requiring the Citizen Band (CB) radios since we have our GPS, cell phones and Google Maps… thanks to the multitude of cell phone towers across America. 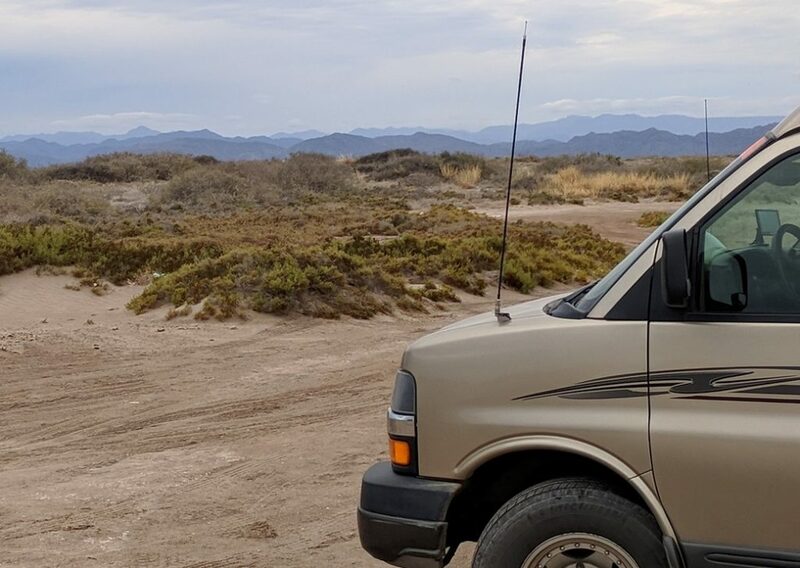 But a large group of RVs traveling in a country like Mexico may find that cell towers are few and far between the more interesting places in Baja. With our CB radios, each rig has the capability to send and receive messages without the need for cell towers or GPS references. So, the purpose of this article is to provide a very basic description of CB radio systems and why they can be our best third world country traveling friend. Getting the travel groups to our destination in a safe and timely manner is assured by timely and meaningful communication with every RV in the group. Communications can include updates on road conditions, approaching turns, topes (speed bumps), vehicle problems, fast approaching vehicles from the rear and approaching safe rest areas along the way. Since some U.S. cell phones tend to be unreliable in Mexico, all communications while traveling in the group are more reliably using our CB radios. 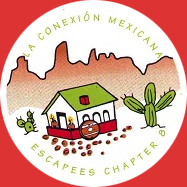 Most rally goers choose to continue traveling together in a smaller group of rally friends once the rally is over whether it is back-to-the border or further on to other Baja California destinations. Your CB radio is your special conversational link every mile of the way with your fellow travelers. CB radio – All CB radios are limited by FCC regulations to 4 watts of transmitting power… no matter how much you pay for the radio… they all put out the same amount of power. Most CB radios come with a microphone, mounting bracket and power cord that plugs into 12 volts. A second choice is to buy a handheld CB radio which can be powered by batteries (some have an external power cord for a 12v. accessory port/cigarette lighter). The handheld CB radio has a small walkie-talkie type antenna limiting the range of the radio… so to meet Mexican Connection requirements, handheld CB radios must also have an exterior antenna to safely reach others in your group. Once spread out along the travel route, it is common for each RV in a travel group to relay a message received to the next RV in line. Antenna – Without your antenna your radio can’t receive or send messages. Since all CB radios are limited to 4 watts of power, the type and tuning of your antenna becomes the most critical aspect of better communication. Most CB antennas use the metal on your vehicle as a “ground plane” that reflects the signal on to your antenna. Those of us with fiberglass rigs need to buy an “NGB” (No Ground Plane) antenna which uses a special length coaxial cable to supply the ground plane effect to a corresponding fiberglass antenna. Like the radio you have several types of antennas to choose from, the fiberglass antenna comes in several different lengths (3, 4 & 5 feet are the most common), the whip antenna (usually the tallest of the antennas) and the magnetic mount antenna. The best antenna is the one that best suits your CB and rig. Antenna mount – You will need a mount to attach your antenna to the outside of the vehicle. With the magnetic mount antennas, the base of the antenna doubles as the antenna mount and the metallic surface becomes the ground plane. While metal surfaces give the best antenna reflectance, serviceably mounts can be attached on either side of a glass window or with a cable into the interior of the RV to the coaxial cable attached to the CB radio. Coaxial (coax) Cable – This is the cable that connects your radio to your antenna. If you are using a magnetic mount antenna the coax cable is included with the antenna mount. CB radio coax usually comes in the common length of 18 feet. If you have extra cable don’t cut it off, instead wrap it in a figure 8 and stow it security. This is especially important if you are using a NGP (No Ground Plane) antenna in a fiberglass rig. Cutting a coax cable can result in a CB radio that cannot be properly tuned. Once you put your CB radio system together, you will need to properly adjust your antenna to your vehicle. This process is called antenna tuning using a SWR meter. Some CB radios come with the SWR meter as part of the unit, most of the radios will require a separate SWR meter for tuning. Failing to tune your antenna may result in poor system performance. When the Rally gets together at Potrero Campground, there will be CB Specialists available with SWR meters to assist you in tuning your antenna. It is important to have all the basic CB radio parts installed and working when you arrive for there are no CB stores in the scenic Potrero hills! ← So, You Are Thinking About Bringing Your Pet To Baja California!